It’s time to remove the zip-out liners in your leather riding jackets and polish up the chrome on your bike! Spring is here and Mississippi Coast Harley Davidson, with the invaluable assistance of the Mississippi Coast Harley Owners Group, is once again teaming with the Muscular Dystrophy Association to raise money and awareness. MS Coast Harley Davidson will be the site to gather on April 20th. A state police escorted ride will leave at 9:30 a.m. Over 100 bikes are expected to take part in the State Police Escorted charity ride that will cover some of the most picturesque parts of the area. The first 100 advance ride/raffle combo ticket buyers will receive a free event t-shirt and MDA pin. Advance tickets are available at the MS Coast Harley Davidson store for only $20. If you only want to go on the escorted ride, a $10 donation is requested (includes passengers) and all proceeds benefit MDA. Riders can expect to be back to the event area by 12:30 p.m.
A lavish silent auction will begin inside the Harley dealership at 10:30 a.m. and last until 2 p.m. Live bands will perform from 11 a.m. to 3 p.m. outside on the grand stage. Lunch will be available from vendors and local artists will have their unique works for sale on vendors’ row. Special prizes can be won at the MDA/H.O.G. Raffle booth. In the past, raffle officials have given away huge outdoor grills, Harley merchandise and even a maxed-out cooler that would fit any outdoor event well. This year’s prizes are going to be well worth the purchase of a ticket. Event officials haven’t yet determined what the prizes will be but anyone wishing to donate items can contact Libby, Harley Davidson Event Coordinator, at MS Coast Harley by calling 228-388-8700. Raffle drawings will be at 1 p.m., 1:30 p.m. and 2:30 p.m. and you must be present to win. A ticket for all three drawings may be purchased the day of the event for only $10. Event t-shirts are priced to sell fast at only $15 and pins are a mere $3. Other motorcycle activities are planned throughout the day. 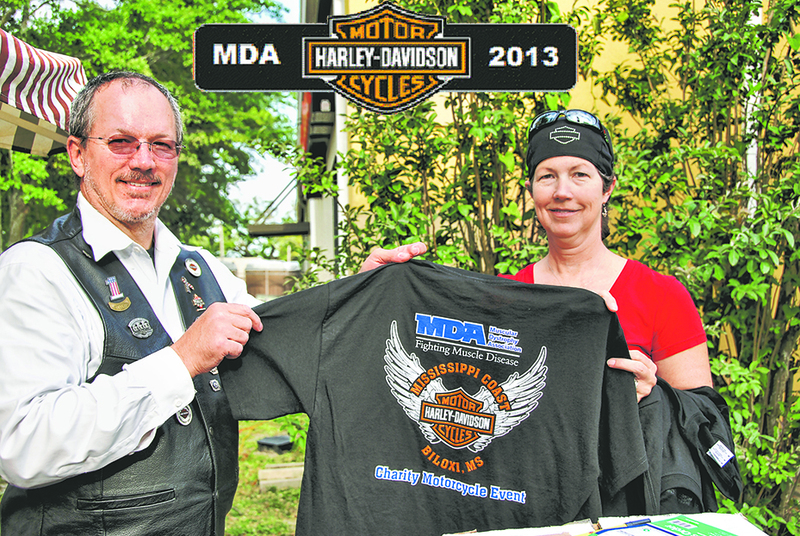 Bill Armbrust, Harley Owners Group Event Coordinator is excited to be helping the MDA. “We are sincerely thankful to all those kind individuals and businesses that donate whether it is in monetary donations or in the form of items we can raffle. We will ensure that every company and person that donates will be acknowledged at the event.” The event still needs the help of area business owners and citizens to make this year’s event a rousing success. Please donate to those who need it the most. You may contact Bill Armbrust for more information about the event at 228-860-5567 or iribiloxi@aol.com. Also joining in the fun will be children and adults with neuromuscular diseases. Last year, some children with muscular dystrophy came to the event and were treated to motorcycle rides, Harley gear and food from vendors. One little girl even set up her own booth and sold lemonade so she could donate the money to MDA! If you could see the beautiful children and the smiles on their little faces when they are out in the sunshine enjoying a day free from doctors and hospitals, you would surely know that there is no more deserving cause than helping MDA advance in their fight to defeat neuromuscular diseases around the world. Make 2013 the year that the MDA helps find a cure! Currently, one in four adults (or 60 million Americans) lives with a mental disorder. That number includes people who are experiencing the effects of trauma in their lives, obsessive-compulsive disorders, anxiety, phobias, depression and schizophrenia. Less than one third of these ever seek help for their conditions, primarily because of the stigma attached to mental illness. People often blame themselves or are blamed by others for being irresponsible, lazy, or too “needy”. But no one should be ashamed of something they could not prevent or did not cause. People boldly seek help for physical maladies, but are afraid to get help for the torment they experience in their own minds every day, even though evidence shows that people who get help experience a better quality of life for themselves and their families. In the past, treatment for mental disorders has evolved from life-long commitment to prisons, then mass housing in asylums, to the adoption of the medical model for treatment. Many states have recently been sanctioned by the US Department of Justice for its lack of care for their citizens with mental illness. The response has been positive in many states, including Mississippi, which is about to launch total reform of their mental health care system. They will be replacing the medical model of care with a more comprehensive community-based system that allows the individual to have more control over their options for care. The Mississippi Department of Mental Health (MDMH) is adopting the definition of recovery used by the national Substance Abuse and Mental Health Services Administration (SAMHSA): “A process of change through which individuals improve their health and wellness, live a self-directed life, and strive to reach their full potential.” The medical model that is currently used focuses on the treatment of symptoms, which creates a population of heavily-medicated individuals who have extreme difficulty in functioning and participating in mainstream life. The old model also is predicated on the doctor or professional being the ultimate authority on what is best for a particular patient, which makes many patients feel powerless, and prevents them from having any say in what happens to them during times when they cannot take care of themselves. Almost all mental conditions are episodic, which means during times when a person is feeling well, they should be able to work together with their mental healthcare providers on their future treatment. The medical model also rarely addresses the psycho-social impact of mental illness on the patient. Good mental health always includes opportunities to engage in social activities, make friends, and contribute to society in some way. The medical model does not factor in these vital elements of a person’s life… those things that people value as essential to a quality life experience. The new model will be person-directed, and service providers will be required to consider their patients’ life goals when devising a treatment plan for them. These changes can be a real paradigm shift for mental healthcare providers around the state. “The service system and its practitioners have taken on some of the characteristics of the disorders they are expected to treat,” explains Aurora Baugh of MDMH, in a presentation she delivered to the state’s community mental health center directors in January of this year. She said mental health professionals are experiencing “denial, projection of blame, grandiosity, preoccupation with power and control.” The changes will require a change in how professionals think about mental health care, changing some of their practices used that reflect old attitudes, and aligning their policies with a more holistic approach to treating patients. It will take time, but the changes will be revolutionary for everyone who lives with mental illness or cares for someone who does. Feelings of powerlessness are debilitating even to people who have no serious mental problems. Empowerment and education are keys to improved quality of life and healthier communities for everyone. May is Mental Health Awareness Month. Mental wellness is about life having a purpose – involvement in work and play, healthy relationships, good physical health and living environment. “Wellness integrates many dimensions of overall health and well-being, all of which are interconnected to an individual’s total well-being,” said Sonya Catchings, a program coordinator at the Mental Health Association of South Mississippi (MHA-SM). “It has a direct correlation to longevity and quality of life. People living with mental illness… experience higher rates of cardiovascular disease, diabetes and obesity. They may die years and even decades earlier than the general population.” MHA-SM is partnering with the National Alliance for Mental Illness (NAMI) throughout the month of May to educate and promote the importance of wellness in everyone’s life, especially individuals living with mental illness. “We are committed to reducing the number of preventable deaths by sharing wellness tools to people along the Gulf Coast to insure a happy holistic life for all,” she said. Several events are planned, and all members of the community are welcomed to participate. You can contact Sonya for a schedule of events by calling (228) 864-6274 or emailing her at sonya@msmentalhealth.org. In June, MHA-SM will once again host their ever-popular annual event, “Don’t Worry, Be Happy, Mon!” Bachelor and Bachelorette Auction on June 6th at IP Casino Resort Spa. Tickets are on sale now, and it is a fun way to support community mental health programs that improve the lives of so many on the MS Gulf Coast. ← Mental Health: Something we all need!